The mood this past week has been “pick up the pace”, and while nobody has actually used those words, it’s simply in the air and everybody is feeling it. Market is looming and there’s no time to waste. Since I have a list of lots of little things to share, let me get to it! 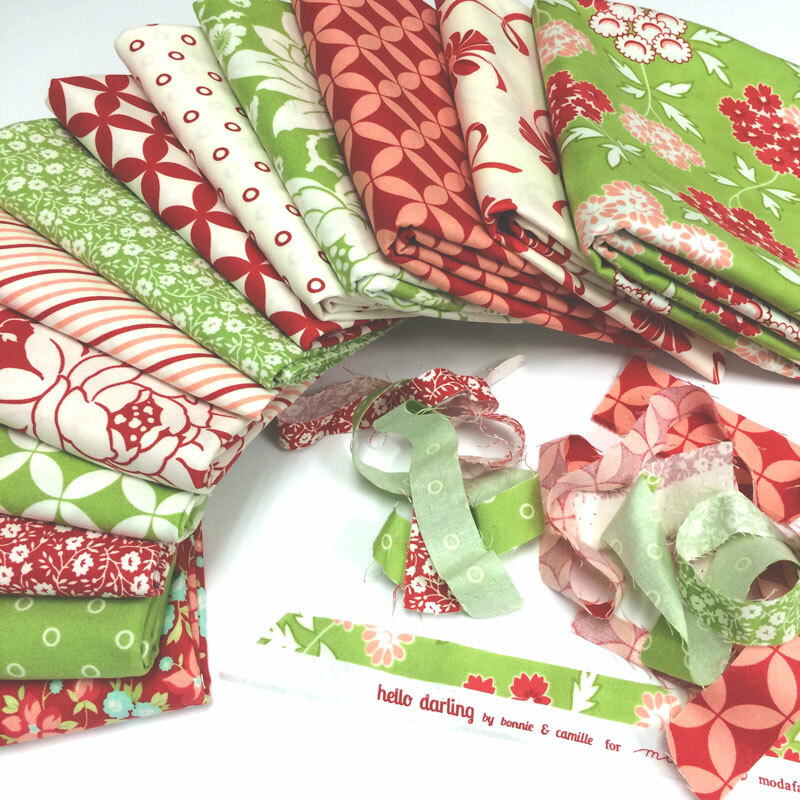 Pretty fabric first – Hello Darling by Bonnie & Camille. Admit it, you’re thinking “Hello Gorgeous!” These are the reds and greens from the collection and I’m thinking these fabrics would make a beautiful Christmas-but-not-just-for-Christmas quilt. Rumor has it that Bonnie – Cotton Way – has a Merry Christmas Darling pattern coming, but Camille’s – Thimble Blossoms – Swoon or Swoon Sixteen are also on my personal radar. If you have a “wee bit” of a Bonnie & Carmille “stash”, I can tell you that they will go beautifully with these red and green prints. Tip Jar! Thank you for all your comments, suggestions, advice and feedback. I appreciate it and I always learn something from you. 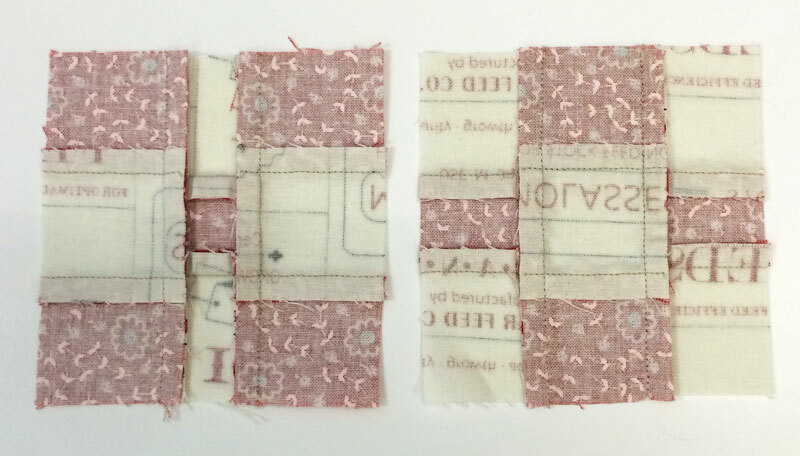 Today’s tip is something I figured out years ago while making a big nine-patch quilt, and I’m absolutely certain that others do the same thing without any help from me. It’ll be in the upcoming Wee Hours pattern because it’ll help there. 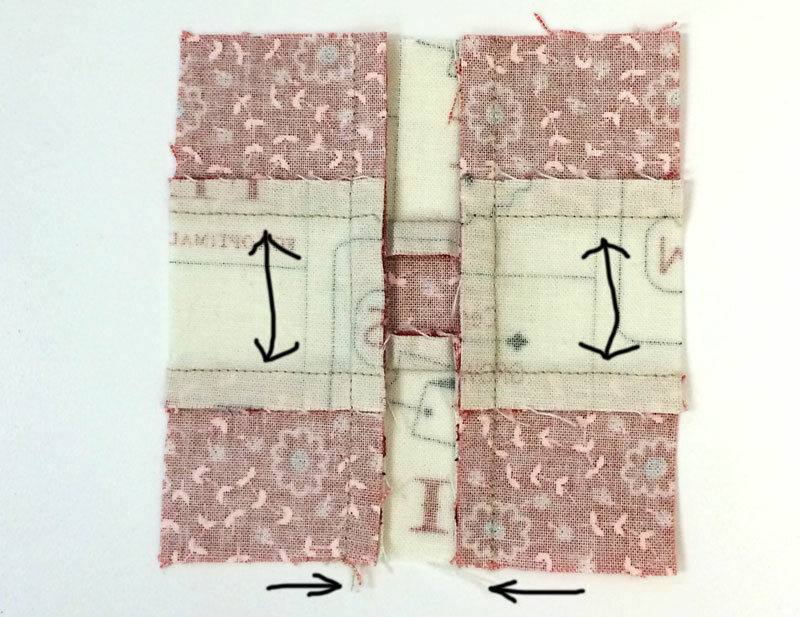 On a nine-patch quilt where the blocks are joined together – nine-patch to nine-patch – a simple little pressing trick can keep all the seams abutting. Two nine-patches – “positive” and “negative”… though that doesn’t matter. The fabrics are Feed Company by Sweetwater. The wrong side – I know, they’re prettier from the front. But on this side you can see the seams and that’s what matters here. Do you see how the horizontal seams on either side of the nine-patch are going in the same direction? They’re pressed “out” on the left and “in” on the right. The trick is to press the long vertical seams in the opposite direction so that each nine-patch as two sides that’s are “innies” and two sides that are “outies”. How good am I getting at Photoshop? NOT! (I was playing with some Aurifloss that landed in the office and then had to rush to finish… yeah, right.) Actually, these arrows look a lot like the hand-drawn drawings I included with patterns… e.g., primitive. Meanwhile… back on the farm, when the seams on the side strips are pressed “out” – away from the middle square, press the two long vertical seams “in” – toward the center. 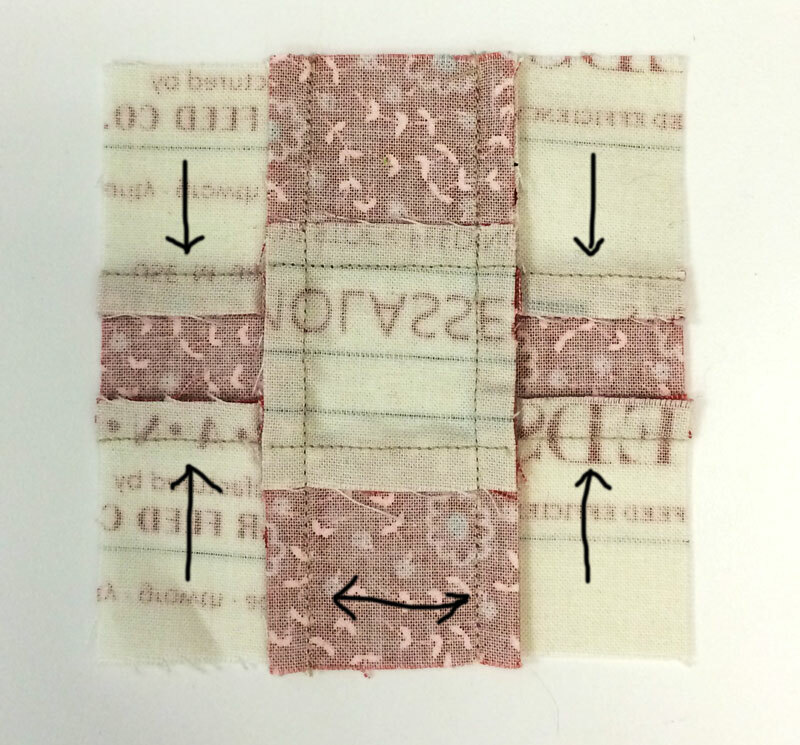 And when the seams on the side strips are pressed “in” – toward the middle square, press the two long vertical seams “out” – away from the center. After the nine-patches are laid out and I like the color placement, I flip them over so they’re wrong-side up and I can turn the blocks so that the seams are always going in the opposing direction. It takes a few minutes to do but it really will make assembling the quilt top easier in the long run. Trust me… been there, cursed those seams going the same direction. This is one of the few times when I can say unequivocally that something works. The rest of the time, my “expertise” is limited to “I made this quilt, this is what I would tell you about making it that I think might be useful for you to know.” I’ve learned a lot about making quilts and sewing over the years from books, magazines, classes and personal experience, and the list of what I know and what I should know are both fairly long. Seriously, I don’t know everything… not even close. (I will happily provide references.) At best, I know what works for me. So I hope you know that you should always take the Tips here with a grain of salt – one of those big, coarse, chunks that you’re supposed to put in a salt grinder. And you won’t hurt my feelings if you disagree – strongly. Several of you asked about whether starch and sizing attracts bugs. Yes and not-to-the-same-degree, but yes. Depending on your climate and locale – city-high-rise vs. on-the-bayou farmhouse, bugs can be a problem. Because it is plant-based, starch is “food” to many bugs. So if you’re not going to wash your quilt for many years, if ever, and you sometimes have issues with bugs, I wouldn’t use starch. The same goes for sizing. Sizing was developed for use with synthetic fibers and unless it specifically states otherwise, sizing is starch mixed with some sort of plastic that enables it to adhere to the synthetic fibers. Sizing generally doesn’t attract bugs as quickly… but again, if you don’t intend to wash the quilt anytime soon, I’d stay away from the sizing too. As for pre-washing, I used to do that with all my fabrics for shrinkage and to remove the chemicals used to “finish” the fabric. 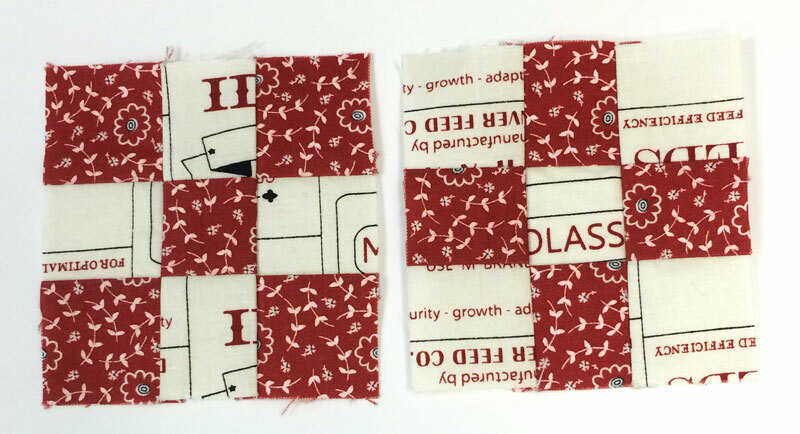 But when I started working with charm squares and other pre-cuts, that wasn’t easily done. The deadlines that came with going to Market and doing patterns, books and magazines only added to my move away from that. I understand that the day may come when the chemicals may start to bother me, or a whole box of Color Catchers won’t remove the excess dye that ran and ruined my quilt… but until then, I’ll live dangerously and hope for the best. And I’ll play with this pretty new fabric. Oh… did I forget to mention that the “pace” being picked up also pertains to almost-daily arrivals of new fabric? The pre-Market and Market collections have started arriving “in the house” – warehouse. From left to right – Polka Dots & Paisley by Minick and Simpson. For You by Brigitte Heitland for Zen Chic. Farmhouse by Joanna Figueroa for Fig Tree Quilts. That’s it for today… or at least that’s everything I can think of that I was supposed to share. Did I forget something? Oh! Thank you for sharing your favorite pre-cuts. I’m much like you… I really love them all and sometimes have a hard time deciding which is my favorite. The Moda Candy? Too cute to pass up… and I did get hooked making those Little Bites quilts. Charm packs? My boss is to blame… “Hi, my name is Carrie and I am a charm-aholic.” (Schnibble-aholic?) Layer Cakes? Charm packs on steroids – twice the fun and a few more options. Fat Eighths and Fat Quarters? Fat Quarters will always be my preference because they’re big and “fat” with possibilities and options. But I’m using the Fat Eighths – labeled F8s at the office – more frequently. Jelly Rolls? I love them… they’re cute… I do have a few that I doubt I’ll ever part with. Or use. They’re just not me… but I sure do love a good jelly doughnut! Close enough, right? As for your favorite real treats and baked goods… I’m sorry I asked. I’m hungry. I’m craving sweets. It’s your fault. I hope you have a terrific weekend – and that you get to make something wonderful. Baking or sewing. Me? I’m sewing. At least that’s the plan… I’ll let you know how that goes next week. Previous Previous post: Beach House: It’s Time to Sew Summer! Love your column although I do and did follow you on your other blog. And, I would put piles of the new fabric around me and then just sit there dreaming-now thats true stress relief. PS: Thanks for all your tips. love all the fabric you show – I like you rarely pre wash my fabric – I do wash my quilts when I get done and toss in a color catcher or two or three and have no problem with them. Good luck on yours – the newer fabric of today seems to bleed less and less all the time. I’ve only had one “bleed” and it years ago and was a dark blue. That one surprised me. Thanks for the tips on pressing. I needed that one. I’m a Niagara girl all the way! thanks to you. Glad to see you’ve adjusted so well, (great attitude) to the land where everything is “BIG”! Just so you know from the land of Big Hair, we only do that because as soon as you walk out the door the wind blows it like crazy, so it doesn’t really matter anymore! LOL. I love seeing all these new fabrics they are certainly on my list! The pressing tips are wonderful , and I just recently started using the starch trick as I will have to say my blocks are way better! Thanks for all your tips and tricks and keep them coming! All those firsties on the new fabrics, am jealous. Love your blog and all the new things coming down (home) from Moda. You are a treasured newby to the Moda team and we get to hear from you lots. What a good idea. Love your tips and I can’t wait to get my hands on those new lines of fabric!!! I have been using the starch for my last two quilts, and it has really helped with precision. This one I am working on couldn’t have been done without it… 😀 I love your column here; you have a great sense of humor! 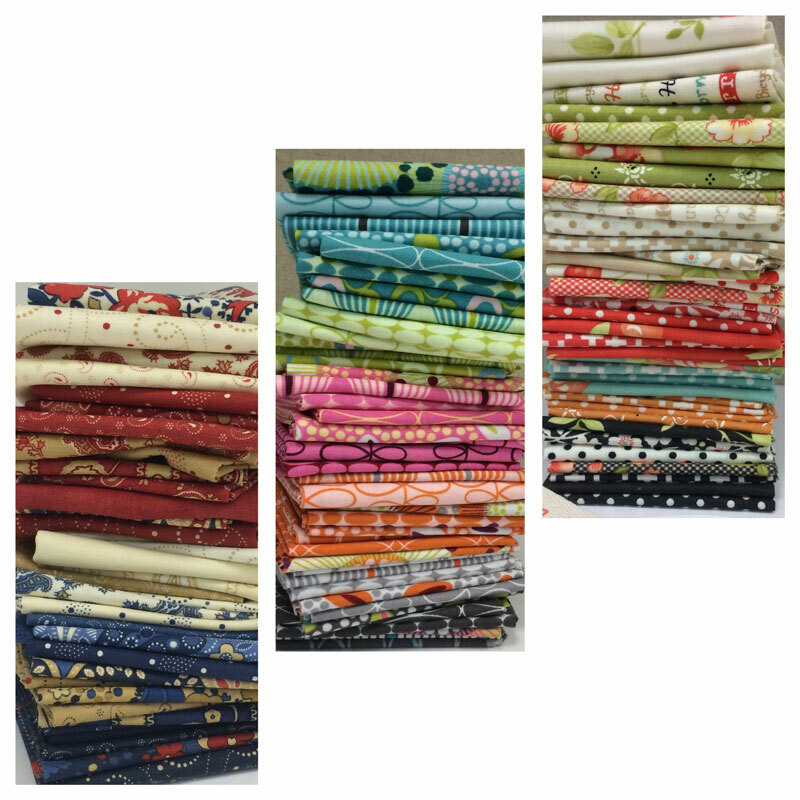 I am drooling over the Bonnie and Camille fabrics – this is my year to use up my stash so I can buy new fabrics (I am amazed at what I have *collected* – read, hoarded – in the two years that I have discovered quilting). Thanks to you, I am on the move to get some fabric pushed into the real world as quilts. Hey, could you give us some quilt ideas for all that Christmas fabric (I have a ton, and I am lost when it comes to some good quilt squares). Such good tips, my precision got a lot better with starch ( well now Flatter) but still need to think ahead more on the pressing, can’t tell you how often I have re-pressed when doing the final,assembly. Thank you for the nine patch ironing tip. Love your patterns. sorry to do this but I would like to email you with a quilting query but alas I ( and stress the me part of that ) I can not find an email for you at Moda. Can you please advise me at my email address – catscats16@hotmail.com.Many thanks.